1.Gaikoku e iku toki pasopo–to ga irimasu. When we are going abroad, we need passport. Usage:toki translates to “when”. 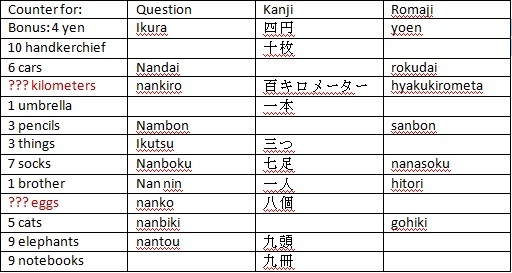 In this example, “iku” is the u-form and base form of ikimasu which means “to go”. Gaikoku means foreign country or abroad. That’s why “Gaikoku e iku toki” literally means when we are going abroad. For the rest of the sentence, pasopo-to is “passport” in katakana and irimasu translates to “need or will need”. 2.Kono botan o osu to kikai ga ugokimasu. Push this button and the machine will work. Usage:to has many uses. In this example it is use as “and” or a connector of two related complete thoughts. The first thought is “Kono botan o osu” which mean “Push this button” (this button push if you translate it literally). The second thought was Kikai ga ugokimasu which means the “machine will work”. Place the particle “to” at the middle and they became connected to each other. Pretty much like how you use “and” in English. 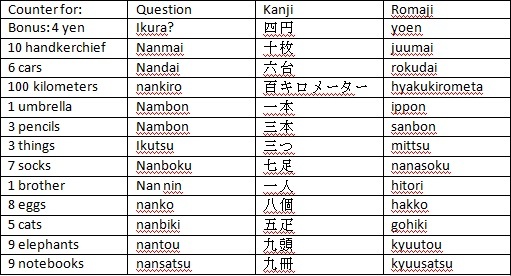 I finished reviewing the Japanese numbers and different counters. There are really many of them! To make sure that these counters would stick with me, I created a short quiz for myself. After a long time, I would answer them again. You can answer it too as a practice! Instruction: Fill in the tables according to what is asked in the column header. A bonus answer is given in the first item. Click the picture to enlarge it. The key to correction is here. if you find any mistake, please put in the comment section. For you reference: go to this learn-japanese-adventure site. They summed up this lesson pretty well! Architect James Law designed a wonderful skyscraping residential complex in Mumbai, India which have a series of swimming pools placed within each balcony. Hands-down, it’s the coolest balcony I have ever seen!